Ellipsis . . . or what is missing? Our amazing language! Why write? Because you never know where it will take you! Is Today A Good Day To Die? Thoughts on mortality and life’s lessons. I am a letterpress printer, a hot metal typesetter, a hand bookbinder, a hand paper maker and paper marbler. I publish books, pamphlets and broadsides and do commissioned book typesetting and printing as well as general commercial printing. Too many letterpress printers want to take your first child in ransom for working with you. Mind you, some first children might be good to be rid of, but you get the idea. Learn more about me. If you enjoyed this, join 262 other subscribers and receive regular articles from Letterpress Book Publishing. 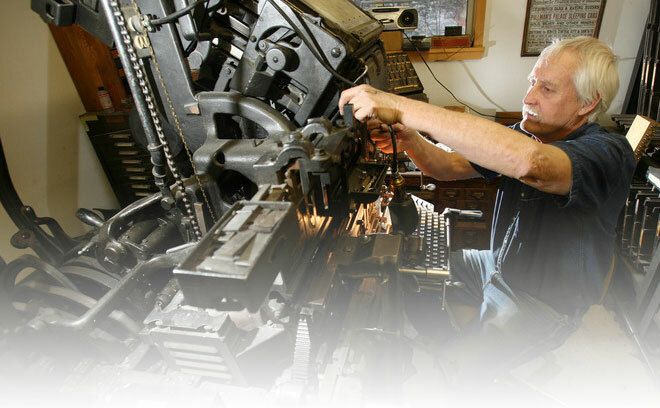 Subjects range from news about letterpress and hot metal typesetting, how to publish your letterpress book, to ideas about philosophy, history, economics and, sometimes, just humorous items. © 2019 Letterpress Book Publishing. All Rights Reserved.